Heroes: Legendary Lucina: Glorious Archer Trailer! A new Legendary Hero is arriving in Fire Emblem Heroes! Prepare to meet our first blue bow user: Lucina: Glorious Archer. She comes with a new Prf bow, Thögn, and a new, powerful Assist skill as well. Check out the trailer below, or scroll down further for a text breakdown. 11 more heroes will be appearing alongside Lucina in the banner, including legendary and seasonal heroes! 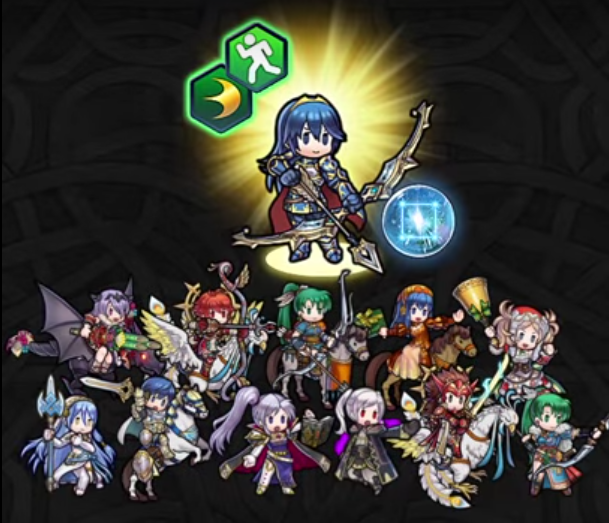 They are: Legendary Ryoma, Exalt Chrom, New Years Camilla, Azura, Ishtar, Legendary Lyn, Christmas Lissa, Valentine Lilina, Legendary Robin, Brave Lyn, and Bow Hinoka. As usual for Legendary Hero banners, the 5★ summoning rate is raised to 8% and no off-focus 5★ units will be available. You’ll be able to summon for Lucina: Glorious Archer and her accompanying heroes starting tomorrow, 31 July. Additionally, If you need a few more Orbs to spend, we’ll also be getting a new Legendary Hero Battle too! Thögn (Blue Bow, Mt 14): Effective against flying foes. Grants Spd+3. If unit initiates combat and foe uses sword, lance, axe, or dragonstone, grants Atk/Spd/Def/Res+4 during combat. Swift Sparrow 2 (A slot): If unit initiates combat, grants Atk/Spd+4 during combat. Wings of Mercy 3 (B slot): If an ally’s HP ≤ 50%, unit can move to a space adjacent to that ally. Well I take it the dislike to like ratio on YouTube is a pretty good indicator that not a single person wants this. Come on IS, stop milking Lucina, Lyn and Camilla and just give us some interesting legendary heroes. I mean Hector and Lyn get one but not Eliwood? Nice try but I’m saving orbs AGAIN and I’m losing even more interest in the game with every crappy Alt banner. It’s not just the never ending parade of alts, but that we get yet another goof of a character instead of their proper endgame form. Hector hasn’t had a single variant not use Armads and we will likely get Brave Armads Hector as well, which is flat out stupid, but here on the other side why would anyone want Bow versions of legendary sword fighter heroes? Lyn and Lucina have enough goofy alts, give them proper legendary forms if you are gonna spam us with them anyway. Because really, so many alts keep the color type of their previous versions: Lucina has only ever been Blue or Red, Nino was kept Green, I already mentioned Hector. There are more bow versions of Lyn than Sword, and more Blue Lucina than Red. They aren’t making every alt different in an interesting enough way half the time for it to be an excuse to make awkward legendary forms out of them. AND she is a colored Bow, the stupidest addition to the game aside from the endless alts… really, when you think about some of this it also kinda feels like they made colored bows specifically to turn Sword legendary heroes into different colors, while also making legendary heroes with physical range and no distant counter, since only legendary heroes have colored bows and they have been trickling out even slower than original character reps have been. Yeah, it’s like they’re scared of innovation. Soon or later, characters like Devdan, Moulder, Boah, Vyland (and a lot more of useless SD units) should appear. If it wasn’t for LLyn’s Tactic I wouldn’t even try this. I think they added colored archers because they wanted variation instead of making them all colorless. Again, it’s like having blue swords because it’s the most common weapon in the franchise. Stupid, indeed. You are wrong dude. There are a bunch of people who are also excited about this. Actually everyone should know that Lucina would get a legendary alt someday. And the thing here is the same with the Leg Lyn banner. Even if a lot of people dislike it, in the end so many people are going to spend money because of these characters that for IS it is going to be a win anyway. This was to be expected, I suppose. Chrom and Lucina both have the same number of variants but the latter is more popular, and female Robin already has a Legendary variant so one for male Robin would’ve been redundant, and nobody else in Awakening is appropriate for the spot of Legendary Hero. If I manage to get her, hopefully she sees more use than Legendary Lyn. Priam should have never existed. Lucina is my favorite Fire Emblem character and I’m excited about this. This could potentially make Alm an Legendary Red Bow Unit, because that´s what happen to Swordunits right now. Oof, that dislike ratio. I’m not really interested in L!Lucina, but I would like either an Azura who isn’t -atk, an Ishtar who isn’t -spd, or a NY!Camila to +. If I do get a L!Lucina, depending on her IVs, I’ll probably just fodder her off for Drive DD. Well Lucina is one of my favorite characters in the series so it’s nice she has another alt. I don’t have many orbs left though since I’ve spent most of them on the Ylissean Visitors banner trying to get Sumia. Oh well, maybe another time…but then again, I don’t play Heroes as much as I used to. P.S. I don’t care about the like/dislike ratio I see on the YouTube video. As a matter of fact, I don’t speak for anyone.